Porvene’s 100 Series Sheet Doors are the “Original Sheet Door”, introduced into the United States in the 1960’s. It’s ease of operation and economical price has made it an industry standard within the construction industry. This product can be Insulated, Windlocked™ , and built with a pass door. This complete product line is available, depending on size, as Hand Operation or Chain Operation and can be upgraded to Electric Operation. Porvene’s 200 Series Sheet Doors are the “Original Sheet Door”, introduced into the United States in the 1960’s. It’s ease of operation and economical price has made it an industry standard within the construction industry. This product can be Insulated, Windlocked™ , and built with a pass door. This complete product line is available, depending on size, as Hand Operation or Chain Operation and can be upgraded to Electric Operation. 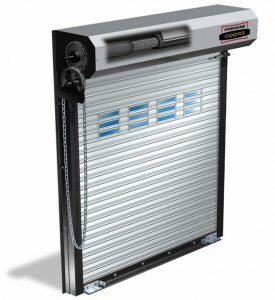 Porvene’s 300 Series Commercial Slat Doors offer the economy of a sheet door with the added strength of a service door. 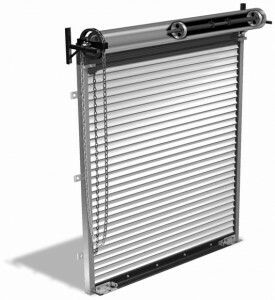 This Model is available with 24 Gauge or 22 Gauge steel slat curtain (some sizes available in 24 gauge only) and can be Windlocked. This complete product line comes standard with chain operation and can be upgraded to electric operation. Porvene’s 400 Series Service Doors offer 24/22/20/18 gauge slats for additional strength. 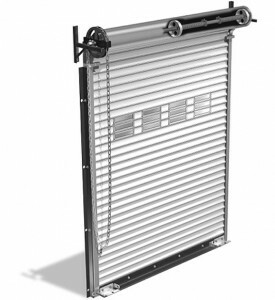 Our new and innovative slat design reduces the snapping sounds that come from metal to metal contact common to rolling steel slat doors when the door is opening and closing. Powder Coating in a wide variety of colors is also available. This product line comes standard with Chain Operation and can be upgraded to Electric Operation. 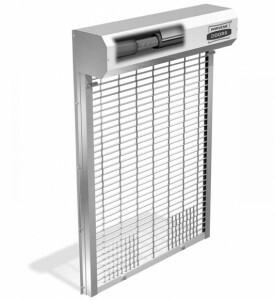 Porvene’s 500 Series Quiet Glide Grille is constructed using Aluminum tubes over solid steel rods giving added strength for security and features low friction nylon blocks mounted to the bottom bar for quiet operation. Clear anodized finish is standard on the guides, bottom bar and round tubes. Available anodized finishes are Gold, Dark Bronze, Light Bronze and Black. The complete line is available, dependent on size, as Hand Operation or Chain Operation and can be upgraded to Electric Operation.